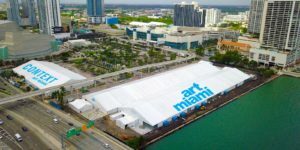 From the press release: The program of CONTEXT Sound Positions started in Miami in 2014, and since then has been a strong platform for the presentation of Sound Art in our fair editions in Miami and New York. Sound Positions creates immersive and intimate situations for listening to work by an international selection of emerging and established sound artists. The exhibition will feature individual listening stations dedicated to the work of a solo artist. For more information click the image above.